Fifty-Fifty presents a new project, Stories for Fishes, which includes film screenings, public dialogue, and collective visual responses. The screenings of Le Maison en Petits Cubes and Thule Tuvalu inspire doodles and discussion. Local participants share experiences of South Florida that they want to remember. Drawings are then shared underwater with fish and other sea creatures off the coast who will eventually inherit the city. Since fish are thought to have spatial memory, the experiment of communicating across species and language attempts to keep memories local. 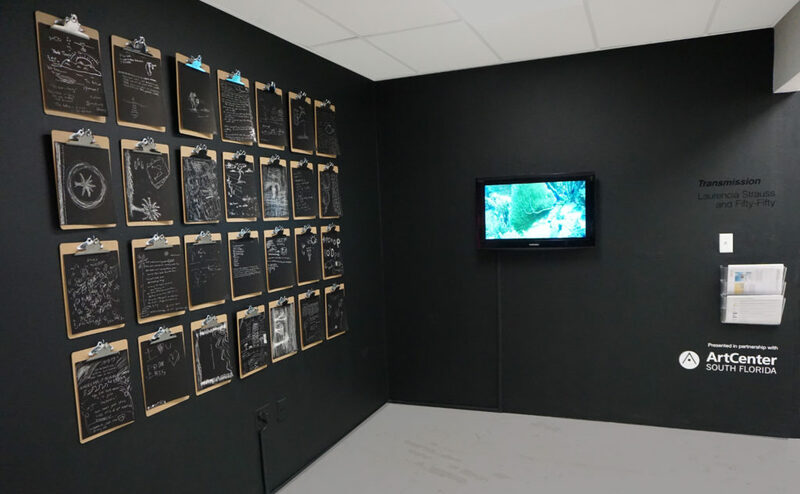 The collected stories and video of the artists sharing them with fish off the coast are combined as part of a larger installation.